Do you remember, How many times you travel to Saudi Arabia or Your Traveled Date to KSA? Ministry Of Interior Saudi Arabia now provides Expatriates to access their Travel Information Records of Exit and Entries in Saudi Arabia through MOI systems using Absher. 1. Visit Ministry Of Interior Saudi Arabia e service website, Login to your Absher account by entering your User name and Password, Verify it with SMS code. If you do not have MOI account read this article "Register for MOI Absher"
2. Once you successfully Logged In, Click on "eServices", You can see a menu left side, Select "Passports" in that, Now at right side you can see an option of "Travel Records Information", Refer below image for clarity, Click on "TRAVEL RECORDS INFORMATION". 3. 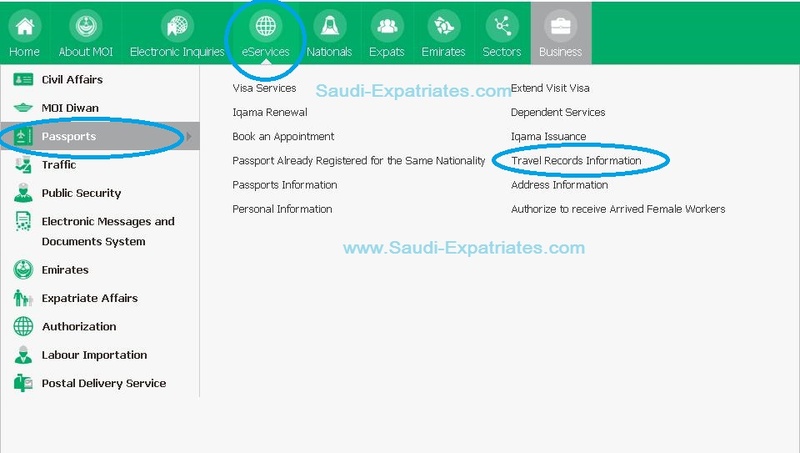 Once you clicked, You can see a new page with your travel information of Exit and Entries records in Saudi Arabia. If You have more than 10 Entries you can select "Show 50 entries" and can view all records. - This information consists of Travel Date, Exit From (Airport Name), Exit To (Traveled Country Name), Exit Carrier (Traveled Flight Number), Check-In Date, Arrival At (Airport Name), Arrival From (Country Name), Entry Carrier (Flight Number).